The magic of this simple nine-patch is in the mix of values used to create different results. Make the nine-patch centers varying 4 background fabrics in some and 5 background fabrics in others. 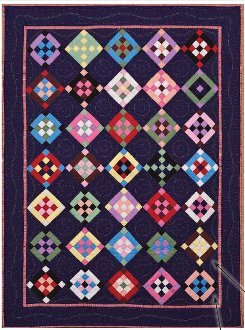 Study the cover quilt to see how mixing values will result in a variety of block designs. Add blocks to make the quilt any size. And to really add WOW, consider trying fabrics with a print! The ALMOST SOLID Quilt is great scrappy fun... Enjoy! Finished size: 51" x 69"